North university graduate, Beth Potts, never has a problem deciding what to do with her unwanted clothes. Beth, 22, from Heywood in Manchester, turns them into eye-catching art like framed ‘dandy men’ portraits or striking kitchen aprons. 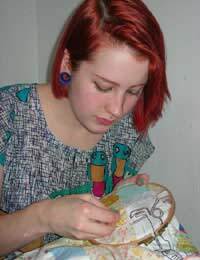 Beth, who studied textile surface design at Bolton University, has been a keen recycler for a number of years. She says she fell in love with her Grandma’s sewing machine when she was just six and she’s loved everything about sewing ever since. Beth visits charity shops on a daily basis because “you never know what might come in and it would be awful to miss something good” and friends and family happily pass on unwanted garments, buttons and pieces of interesting fabric. “Everyone knows that I’m always on the look out for materials that I can use,” she said. “They save me lots of scraps of material and any clothes that they no longer want. “I also buy occasionally from a house clearance shop. When I was making the portraits for my degree work, I managed to get a number of old picture frames from there. Currently, Beth works part time at Retro Rehab, a vintage clothes shop in Manchester, where she mends and alters outfits. But she is also hoping to establish a successful online business making unusual art, embroidered pinnies and kitchen and dining room accessories. Last year she was invited to display her work at a major festival in Manchester and she also sold some of her work at an exhibition for new designers in London. Beth has also branched out into making useful items from other people’s cast offs. “At Christmas I made napkins for my mum and some other relatives and I also made my own Christmas cards,” she said. Beth has now set up her own small business, Beth’s Sew Recycled which she promotes through Facebook and she is building an online portfolio of work and products for sale. “I’m really hoping that my work will appeal to people looking for something unusual and I am also happy to undertake commissions,” she said.